While many people don’t utilize their attic space for applications besides storage, the area is a large contributing factor to how well your home keeps warm or cool. Furthermore, if your attic is poorly insulated, you may be spending more than you should be on heating and cooling costs. This article is going to help you understand the importance of a properly insulated attic and what type of insulation may be best for your home. Unfinished areas in your home, like the attic or basement, can leave your home vulnerable to higher energy usage. Luckily, ensuring your attic is properly insulated is one of the easiest ways to reduce your heating and cooling costs. In fact, good insulation can help decrease a homeowner’s heating and cooling expenses by more than 40%. Because air naturally flows from warm areas to cold areas, the warm air in your home during the winter tries to escape to the cooler air outside. The same thing happens in the summer, with the cool air inside trying to escape to the warmer air outside. Insulation works by decreasing the air movement within the home. So with the air trapped inside, the insulation materials will prevent the heat or cool air from escaping. Because there are so many different types of attics, there is also a variety of insulation materials to fit different needs. There are three common types of insulation homeowners can choose from. 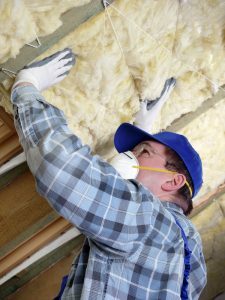 Foam insulation is created by a chemical reaction. When the materials bond together, the expansive material naturally seals up any cracks or holes. Because of this unique ability, this insulation material works best for any old attics with deep crevices that won’t be able to be filled by other insulation materials. This type of insulation starts as insulation fibers which are then packaged into bags and blown in place until they are the desired depth and density. This is the best insulation material for attics with irregular joist spacing, attics with a lot of obstructions to work around, or attics with limited room for maneuvering during the installation process. This material is extremely flexible and is often packaged in rolls that come in a variety of thicknesses and widths. To achieve the desired level of insulation, homeowners can simply add more layers. Attics with standard joist spacing and few obstructions can easily benefit from this type of insulation. Insulating attic ceilings and walls is an important factor in keeping your home comfortably warm or cool without breaking the bank. If you’re interested in learning more about attic insulation installation, contact a local contractor today.